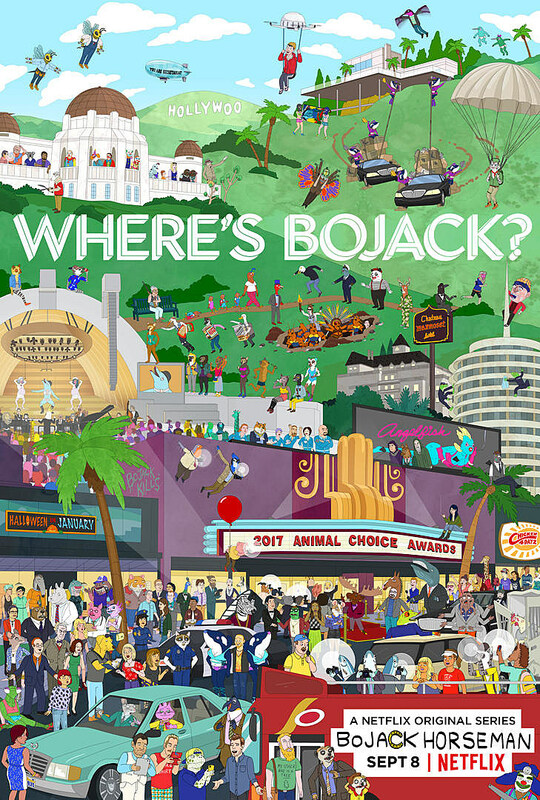 BoJack Horseman is no stranger to disappearances, but disappearing from his own show is another matter. That cryptic Season 3 finale has given way to a BoJack Horseman Season 4 trailer almost entirely absent its title character. Netflix released a full trailer for BoJack Horseman Season 4 ahead of its September 8 premiere, though BoJack himself only makes brief appearances in the new footage. Instead, the focus shifts to Diane (GLOW star Alison Brie), leaving messages for the absent BoJack while Mr. Peanut Butter (Paul F. Tompkins) runs for Governor, and Todd (Aaron Paul) takes off on new business ventures. Bam boom, BoJack Horseman season four synopsis, here we go. Okay, so this season is full of all the things people love about their favorite depressed talking horse. First of all, you’ve got BoJack himself, who is up to his old tricks. Then you have Princess Carolyn, who is one cool cat. While Princess Carolyn toys with the idea of starting a family, BoJack has family issues of his own. This season, on BoJack Horseman. Meanwhile, Diane and Mr. Peanutbutter have family issues of their own. You might say their marriage is “in a pit,” if you know what I mean (which you won’t, until you watch the season). Meanwhile Todd has issues of his own – as he explores his own evolving sexual identity and also in some episodes doesn’t do that. Oh! And Mr. Peanutbutter’s running for governor now; I forgot to mention that, that’s important. Also, in one episode BoJack wears a new hat! Bet you want to tune in to see that new hat, huh? Okay, I lied, there’s no new hat. I just really want you to watch the new season of BoJack Horseman! Elsewhere, it looks as if Season 4 will pick up Season 3’s implication that BoJack has a daughter out there, but his won’t be the only family in peril. Princess Carolyn may have trouble settling down with Ralph Stilton (Hannibal alum Raúl Esparza), while Diane and Mr. Peanut Butter look to get in a nasty fight. We’ll hear more soon, including guest stars (cough, Character Actress Margo Martindale), so stay tuned for the latest on BoJack Horseman Season 4 before its September premiere.